ಆನಿ ಪವಿತ್ರ್ ಆತ್ಮ್ಯಾಚ್ಯಾ ಕುರ್ಪೆನ್ ತಿ ಗರ್ಬೆಸ್ತ್ ಜಾಲಿ. ನಮಾನ್ ಮಾರ್ಯೆ, ಕುರ್ಪೆನ್ ಭರ್ಲೆಲೆ ಸರ್ವೆಸ್ಪರ್ ತುಜೆ ಥಾಂಯ್ ಆಸಾ, ಅಸ್ತರಯಾಂ ಮದೆಂ ತುಂ ಸೊದೈವ್, ಆನಿ ಸೊದೈವ್ ತುಜೊ ‌ಪುತ್ ಜೆಜು. ಭಾಗೆವಂತ್ ಮಾರ್ಯೆ, ದೆವಾಚ್ಯಾ ಮಾಯೆ ಆಮಾಂ ಪಾಪ್ಯಾಂ ‌ಖಾತಿರ್ ವಿಂತಿ ಕರ್ ಆತಾಂ ಆನಿ ಆಮ್ಚ್ಯಾ ಮರ್ಣಾಚ್ಯಾ ‌ವೆಳಾರ್ . ಸರ್ವೆಸ್ಪರಾ, ಆಮ್ಚ್ಯಾಂ ಕಾಳ್ಜಾಂನಿಂ ತುಜಿ ಕುರ್ಪಾ ಘಾಲ್ ಮ್ಹೂನ್ ಮಾಗ್ತಾಂವ್. ತುಜ್ಯಾ ಭಡ್ವ್ಯಾನ್ ಆಮ್ಕಾಂ ಕಳಯ್ಲಾಂ ದೆಖುನ್ ಜೆಜು ತುಜೊ ‌ಪುತ್ ಮನೀಸ್‌ ಜಾಲೊ ಮ್ಹುಣ್ ಆಮಿ ಅಳ್ಖುಂಕ್ ಪಾವ್ಲ್ಯಾಂವ್ ಆತಾಂ ಆಮಿ ತಾಚ್ಯಾಂ ಕಶ್ಟಾಂ ಆನಿ ಖುರ್ಸಾ ವರ್ವಿಂ ಪುಣರ್ಜಿವಾಂತ್ ಪೊಣಾಚ್ಯಾ ವೈಭ್ವಾಕ್ ಪಾವುಂ-ಶಿಂ ಕರ್ ತ್ಯಾಚ್‌ ಕ್ರಿಸ್ತಾ ಆಮ್ಚ್ಯಾ ಸಮೀಯಾ ವರ್ವಿಂ. ಆಮೆನ್ ದೆವಾಚೊ ಆದಾರ್ ಸದಾಂಚ್ ಆಮ್ಚೆ ಥಾಂಯ್ ಆಸುಂ. The Angelus is a Catholic devotion commemorating the Incarnation. 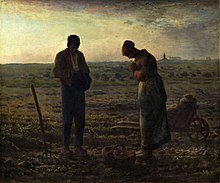 As with many Catholic prayers, the name Angelus is derived from its incipit: Angelus Domini nuntiavit Mariæ ("... the Angel of the Lord declared unto Mary ...") and is practised by reciting as versicle and response three Biblical verses describing the mystery; alternating with the prayer "Hail Mary!" The Angelus exemplifies a species of prayers called the prayer of the devotee. The devotion was traditionally recited in Roman Catholic churches, convents, and monasteries three times daily: 6:00 am, noon, and 6:00 pm (many churches still follow the devotion, and some practice it at home). The devotion is also used by some Anglican and Lutheran churches. The Angelus is usually accompanied by the ringing of the Angelus bell, which is a call to prayer and to spread good-will to everyone. 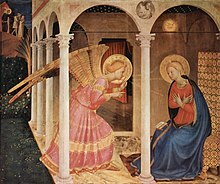 The angel referred to in the prayer is Gabriel, a messenger of God who revealed to Mary that she would conceive a child to be born the Son of God. (Luke 1:26-38). Oremus. Gratiam tuam, quaesumus, Domine, mentibus nostris infunde; ut qui, Angelo nuntiante, Christi Filii tui incarnationem cognovimus, per passionem eius et crucem ad resurrectionis gloriam perducamur. Per eundem Christum Dominum nostrum. ℟: Amen. Hail Mary, full of grace; the Lord is with Thee: blessed art thou among women, and blessed is the fruit of thy womb, Jesus. * Holy Mary, Mother of God, pray for us sinners, now and at the hour of our death. Pour forth, we beseech Thee, Lord, Thy grace into our hearts; that, as we have known the Incarnation of Christ, Thy Son, by the message of an angel, so by His Passion and Cross we may be brought to the glory of the Resurrection. Through the same Christ our Lord. ℟. Amen.